We are now into our third summer at Three Lily Farm and it has proven to be the most abundant on the fruit front. We are in the midst of heavy harvesting of multiple berries every day now which has allowed us to stockpile them away in the freezer plus consuming copious amounts of fruit throughout the day. A few berry recipes have come to my attention this week, so I thought I'd tie up my apron and do some baking. Beth, over at Local Milk has one of my favorite food blogs. Her beautiful photography along with the use of unique ingredients and recipes intakes me enough to check out what's new on the daily. 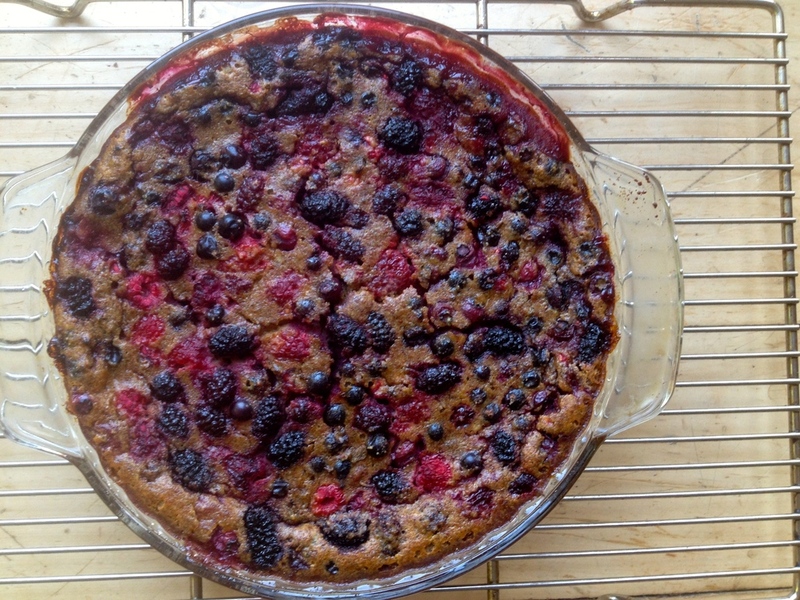 This berry clafoutis recipe is adapted from her cherry version found here. Preheat the oven to 375°F. Grease a 9-inch pie pan with unsalted butter. Place the berries into the greased pie pan. Gently shake to spread them out. In a bowl whisk together the eggs, milk, yogurt, remaining sugar, almond flour, buckwheat flour, vanilla, and salt until smooth. Pour mixture over the fruit. Allow to cool slightly before serving..
Can you say "Clafoutis"? There's been a running joke in our house this week of everyone pronouncing it correctly/incorrectly, and so far Wilder has been the best at it! What are you making with the berry abundance this summer? Leave us a comment below!